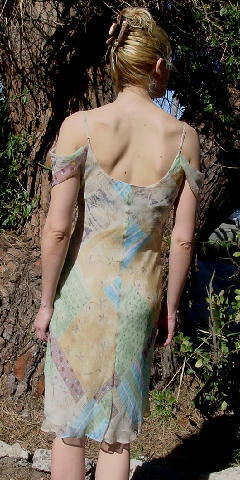 This sheer 100% silk dress has a pale lime sherbet lining of 100% polyester. 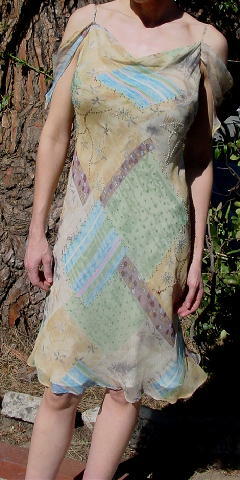 It's by Lapis and it has adjustable 9" by 1/4" spaghetti straps and a scarf arm accent. 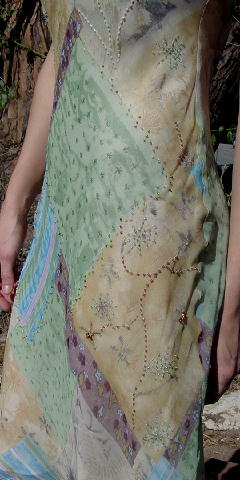 The front top has a layered scarf effect. The sheer overdress has a flower, line, and freeform design pattern in sandy-yellow, pink, light and medium muted green, light cocoa, honey, offwhite, antique white, dark gray, red-wine, and pale and light blue. 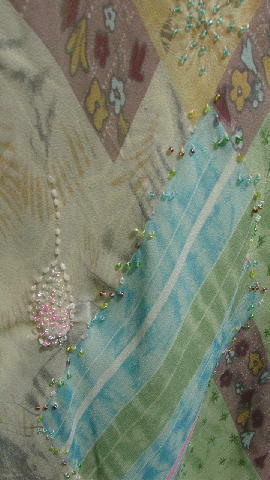 The front has tiny beads in clear, pale green, pink, light brown, bright green, antique white, silver, hot pink, wine, peach, yellow, orange, and red. There's no beadwork on the back. The slip is 5" shorter than the dress. The dress looks better in person. A New York model wore it to a wedding and reception, and also to a university graduation ceremony and party. shoulder strap to hem 44"
armpit to bottom hem of dress 38"
armpit to bottom hem of slip 33"
side to side bottom hem 32"
side to side bottom of lining 30 1/2"